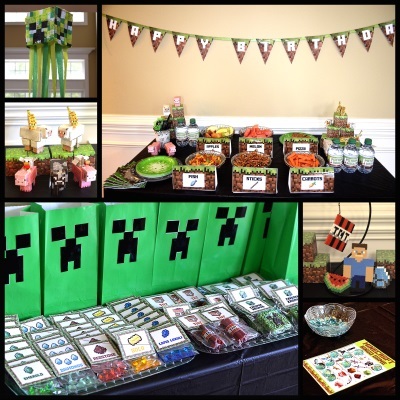 This year's theme was Minecraft! 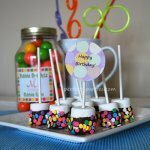 The girls wanted to host their party at home so we did a lot of research and came up with some really neat ideas! We will provide links to many free sources we found online. We found a few nice ones on Etsy but after a lot of browsing, we found a wonderful site that offered a free pdf. Included are labels for water bottles, food and a party sign. We found these at Printabelle.com We entered the information using paint.net and printed them on glossy photo paper. 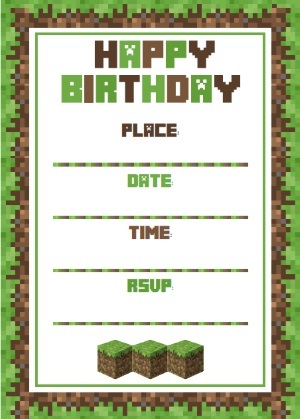 White card stock would also work well for an invitation. If you are not familiar with a photo editing program, you can print and fill in the information after. 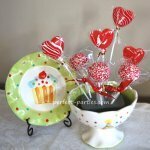 These were used to decorate all the tables as well as a party craft. The kids loved making these and each took a couple home. Each box had approximately 30 pieces. 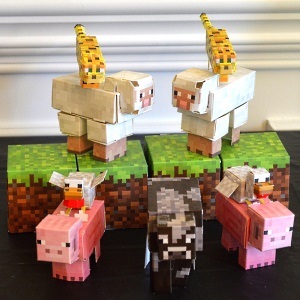 The quality of the pieces, colorful animals and the ease of punching the pieces out to assemble were well worth it. 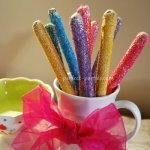 Ages 10 can easily make these unassisted. Having scotch tape handy was helpful. It would be best for ages 8+ unless you have adult assistance. The banner was printed from the link above and we bought a roll of ribbon and stapled the pieces onto it to make the banner. 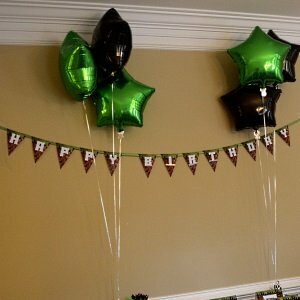 The balloons were from The Dollar Tree. Get a couple extra if you buy it a week before...I always have one or two that deflate. I buy a couple for our mailbox as well. This was the easy part! 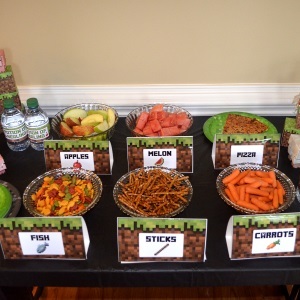 Just print the labels and find dishes for: Fish - Goldfish Crackers Sticks - Pretzels Carrots - Baby Carrots Apples - Sliced Apples (in lemon water to prevent browning) Melon - Watermelon Potion of Healing - Water Pizza! 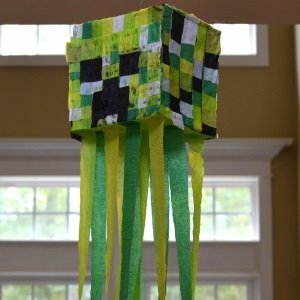 We made our own pinata using a thin box, paper mache and streamers. We will post a how to shortly. 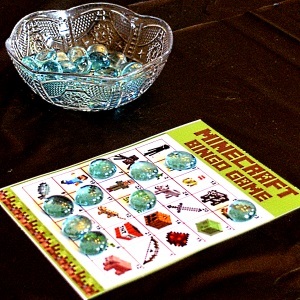 We downloaded these cards and printed them on photo paper for a nice glossy print with vivid colors and we found these glass pebbles from the Dollar Tree that are often used to fill vases or fish tanks. 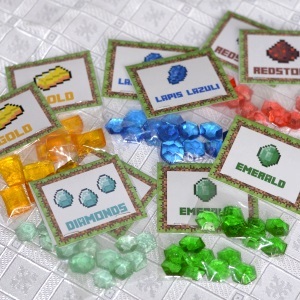 They come in many colors and are cute to resemble the gems in Minecraft. 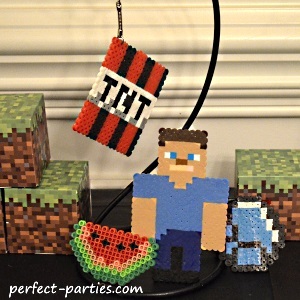 Perler Beads were a great make and take. We watched a few You Tube videos to get some key tips. We bought most of the supplies from Michaels and Amazon. You will need a helper to make sure everything is done on time by the end of the party! We made them into keychains for each child to go home with. We will create a "how to" page for those wanting more tips. Here is a maze we found and I shrunk to fit two to a page. Print on white paper for best results. 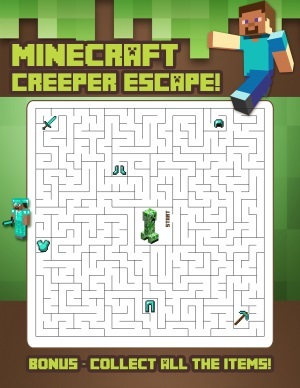 Minecraft Maze . I cut off the site on my original page when I made it smaller and will post when I can locate it to give the proper credit! 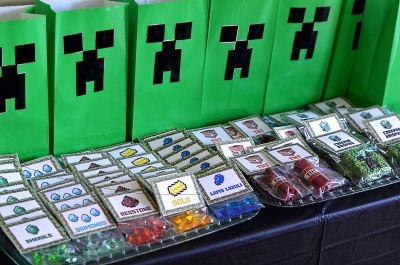 We made simple Creeper Goody bags by printing out the Creeper Faces on photo paper, cutting them out and gluing to green bags. We made TNT with Twizzlers and Creeper Rice Krispie Treats. We made Candy Gems for each of the children to take home. Click the link for our how to. You can also buy these on Etsy but they need to be ordered a couple weeks in advance.